Why is it we think immediately of the car in the driveway when we think of winter servicing? For those us who lean on our firewood processing machinery for our livelihoods, we need to put the same care and attention into them, especially in harsher conditions and cold weather. To ensure smooth running of your firewood processor in the winter months, make sure you check and replace the following areas. Chains are simply the difference between a speedy processor and a slogging machine. With renewed cutting surfaces a firewood processor can work faster, more efficiently and cleaner. A dull chain will also heat the bar and damage the temper of the material, causing it the chain to chew through the guides. Sharpen the chain. You should be able to sharpen a chain around 10 times before needing to replace it. To do this you’ll need a chain grinder like the OREGON CHAIN GRINDER available from M.Large. When you’ve sharpened the chain to within an inch of it’s life or you’re losing teeth from your chain, it’s time to replace it. M.Large are stockists of Oregon chains and as we bulk purchase, we are able to offer highly competitive rates for replacement chains to get you cutting smooth and fast again. Just as the chain does the cutting, the bar, carries the chain and keeps it oiled and lubricated. Make sure it’s doing just that. Check the guides are not worn, and not discoloured blue, a sure sign of damaged temper from overheating. Check oil is flowing by checking the hood of the processor. If oil is flowing, there should be some oil spatter on the surface. If not, check the oil level and also that the oil filler hole is not blocked. V-Belts need to be tight, but not over tight. Check the tension of a belt by pressing it down. The correct tension of a belt should allow 20mm of “play” when pressed down with moderate force. Belts should not be slipping usually apparent by a squealing sound, much as in a car’s fan belt. If a belt is squealing it either not tensioned correctly or is showing signs of imminent failure. Belt replacement is an inexpensive and simple way to ensure your processor is working to it’s optimum ability, thus keeping your business or your home stocked with supplies of firewood. 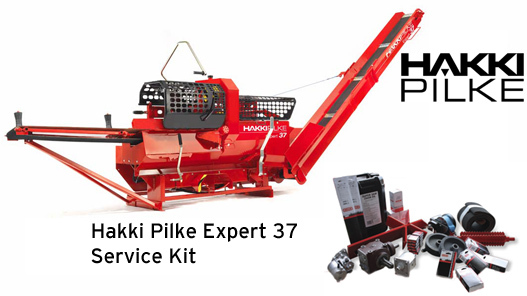 We highly recommend that those with the very popular Hakki Pilke Expert 37 firewood processor should consider purchasing M.Large’s Expert 37 Winter Service Kit. This specially designed kit comes with all the spares and consumable parts you’ll need to keep an Expert 37 firewood processor in top working order. You can find more details about the kit contents and pricing in our machinery section.